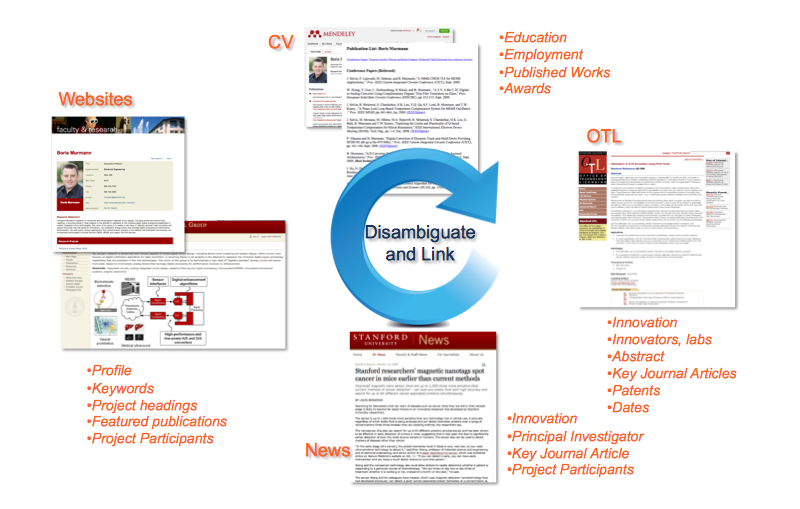 The Visible Legacy knowledge map is created automatically from public resources such as curriculum vitae (CV), websites, published works and news feeds. The information is presented with interactive visualizations as timelines, thumbnails, tag clouds, and a map of relationships. The map is explored with the interactive website enabling users to navigate the connections, moving from people to projects through the Visible Legacy network of information ("the graph"). Visible Legacy's sophisticated algorithms disambiguate and link information: creating tags, extracting dates and keywords, finding connections, and "snapping information to the grid" of open data on the web. The information is stored in the cloud as a "graph database". Proprietary analysis algorithms (illustrated) discern collaborations, projects, and innovations. The engine constantly checks facts in rotation so we call it our Wankel Engine. The Visible Legacy knowledge map created with the Wankel Engine.